The No. 10-seeded Buffalo Bulls women's team, featuring five Canadians, pulled away late for a 82-71 win over the No. 7 Rutgers Scarlet Knights in Storrs, Conn. The Bulls' other three Canadians — Oceane Kounkou of Gatineau, Que., Ayoleka Sodade of Windsor, Ont., and Keowa Walters of Toronto — did not play. While he didn't have a huge day, at least Alexander erased memories of being sidelined with a hip injury in Tennessee's second-round loss to upstart Loyola-Chicago last year. The Ramblers went all the way to the Final Four after that win. Meanwhile, Hamilton's Hailey Brown had six points and two rebounds as the No. 8-seeded Michigan Wolverines women's team beat the No. 9 Kansas State Wildcats 84-54 in Louisville, Ky.
Montreal's Luguentz Dort was held to 12 points by Buffalo in the Bulls' 91-74 win over the Arizona State Sun Devils in Tulsa, Okla.
Dort, who had 21 points in Arizona State's play-in win over St. John's on Wednesday, shot 4 of 12 from the field against Buffalo and had three rebounds, two assists and four fouls. A couple of Canadian versus Canadian matchups are part of Saturday's men's schedule. Ignas Brazdeikis of Oakville, Ont., and his No. 2 Michigan Wolverines square off with Andrew Nembhard of Aurora, Ont., and the No. 10 Florida Gators in Des Moines, Iowa. Later, Vancouver's Brandon Clarke takes to the floor with the No. 1 Gonzaga Bulldogs for a contest with the No. 10 Baylor Bears, who have Devonte Bandoo of Brampton, Ont., on their roster, in Salt Lake City. 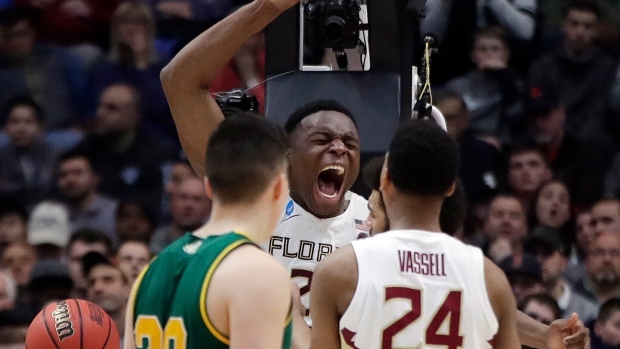 Mfiondu Kabengele of Burlington, Ont., fresh off a double-double in Florida State's tournament-opening win, also returns to action as the No. 4 Seminoles face the No. 12 Murray State Racers in Hartford, Conn.
"I think with our team, obviously our quality of our depth, our length, but more especially our intelligence. I feel like we're one of the smarter teams in this conference," Kabengele said. "I feel that goes underrated, and I feel like our decision-making and our game plan preparation is very excellent." On the women's side, top Canadian Bridget Carleton plays her first game of the tournament with Iowa State as the No. 3 Cyclones play host to the No. 14 New Mexico State Aggies. Carleton was 13th in the country in scoring this season. Shay Colley of Brampton, Ont., also one of the top Canadian women in the NCAA ranks, begins her tournament with the No. 9 Michigan State Spartans against the No. 8 Central Michigan Chippewas in South Bend, Ind. Other Canadian women in action include Alyssa Jerome (Stanford, Toronto) and Aislinn Konig (North Carolina State, Surrey, B.C.